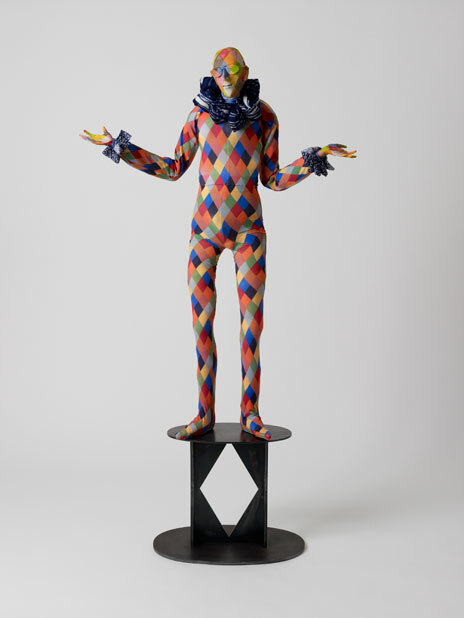 Francis Upritchard, born in New Zealand and now resident in London, makes figurative sculpture that treads a line between realism and fantasy; while in some respects flamboyantly theatrical, it is also keenly observant of human nature. Made from polymer clay, painted, and clad in colourful textiles, the figures are displayed on elaborate bases; they seem, very often, to be taking part in a pageant or masquerade, for their expressions and gestures appear to be orchestrated and conceived in unison. The mood of these curious figures is distant but disconcerting; they seem unhappy, questing, caught up in a search for something beyond reach. Their gaze tends to be inward and melancholic. Looking strikingly like hippies from the late 1960s and evocative of mediaeval jesters and holy fools, they are both archetypal and beautifully decorative. The artist has remarked that, above all, she associates hippies with failure, and that everything embraced and envisioned by the 1960s counterculture either ended unhappily or didn't actually materialise. 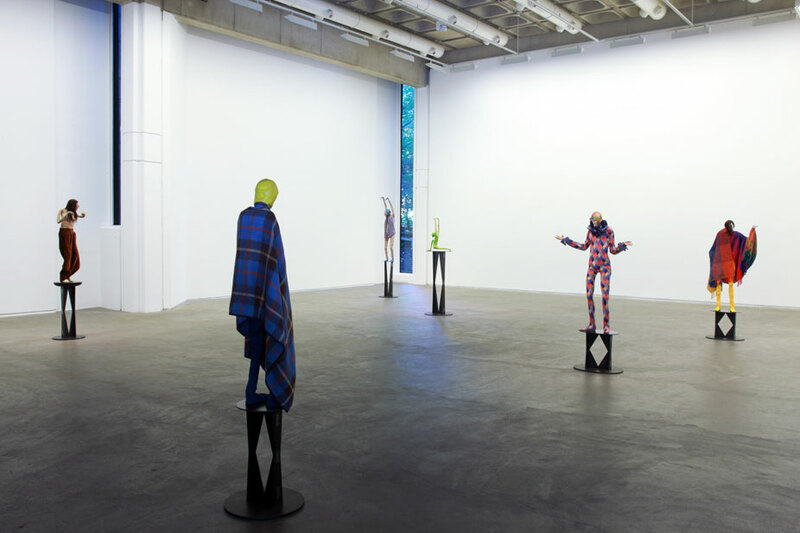 Nonetheless, her apparent rejection of these ideals, as expressed in the disenchantment of her sculpted figures, is itself significant, for Upritchard's discomfort with the aspirations of the counterculture may also disguise a deeper longing for their achievement. In this respect, and perhaps in others, her work echoes some of the ideas inherent in the celebrated 'The Tomb - Death of a Hippie' by the influential American artist Paul Thek. Intentionally or otherwise, Upritchard's installations (which may include found or crafted objects) can be reminiscent of some of the cultural touchstones of those times. The Gothic tales of Mervyn Peake spring to mind, as do some of the novels of Hermann Hesse; even more strongly, they evoke Ingmar Bergman's 'The Seventh Seal', which tells the story of a mediaeval knight making his way home from the crusades during a plague, bringing with him a motley group of misfits and travelling players. Neither those books nor the film are given undue attention these days, but they nonetheless bear a strange poetic charge that can also be found in Francis Upritchard's sculpture. Francis Upritchard has exhibited widely around the world, most recently in the USA, Japan, and the UK, as well as at the 2009 Venice Biennale. She is represented by Kate MacGarry in London, by Anton Kern Gallery in New York, and by Ivan Anthony in New Zealand. Click here to view the publication that accompanies this exhibition.